With their job taking them to the remotest parts of the state, the postmen in Meghalaya will be assigned a new task -- report on human trafficking cases. An NGO, Impulse, has entered into an understanding with the Indian Postal Services to reach out to remotest villages in the Northeast for disseminating information on human trafficking. "People in remote villages of the region do not have access to any sort of information, be it on the very notion of human trafficking or available ways and measures for their redressal." "They are hesitant to go to the police station and report cases of missing children from their localities or villages," the team leader of Impulse, Hasina Kharbhih, said. The project includes setting up of common service centres in post offices as coordinating locations in the region. 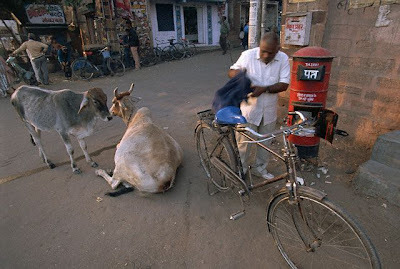 "The postman will distribute pamphlets on awareness. Also upon receiving any information on missing children or person, he will intimate, transmit and guide the information to the coordinator placed at the CSCs." "The coordinator will subsequently work out a rescue strategy with the law-enforcement agencies and local NGOs," Kharbhih said. Objective of the project is to create a sustainable harmonising environment for the communities to combat trafficking along with NGOs and law-enforcement agencies by utilising the reach of the Indian Postal Services, Kharbhih said. About 44,000 children go missing in India annually and only 22 pc of them are traced, most of them victims of human trafficking. Rescue operations conducted by NGOs show that majority of the victims belong to remote villages like those in some parts of Northeast where the illiterate masses do not have any access to information.